It's the middle of the week, and you could probably use a little boost. Some new apps on your Android device might perk you right up. We can even save you some money on them. 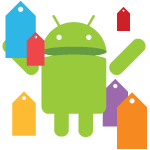 Get your Google Wallet ready and check out the app and game sales we've spotted today. That's it for now, but check back in a bit. We'll add anything else we come across.